In my never-ending quest to get better at identifying which Sprint Cup drivers will run well each week, I’ve been reading up on the tires Goodyear provides the race teams and trying to figure out if and how I should add a tire factor into my weekly analysis. I’m kinda stumped, and unfortunately I don’t have access to someone like Chad Knaus to turn to for enlightenment. So, I figure I’ll turn to you, the readers, and see if we can get a discussion going. To that end, I’ve posted two questions below. It seems clear changes in tire construction and compounds affect a NASCAR Sprint Cup car’s handling. Just changing the air pressure in a tire changes the handling–that’s actually a primary set-up tuning tool. The question is, how much does a new/different-type tire affect the handling? Let’s say you take the exact car Kyle Busch won with at last year’s Bristol race on a clear, 70-degree F day and run 50 laps at Bristol with a fresh set of the tires he won during that race. Then, without changing a thing (including the weather), you bolt on a fresh set of the tires the series will run this weekend (they’re different, correct?) and run another 50 laps. How much differently will the car run? Slower through all 50 laps? Faster through all 50? Maybe the same at first, but then fall off quicker? I imagine there are a zillion variables that play into this, but if we can get at least some sense of how significant a tire change is, we’ll gain a better understanding of how much a tire change decreases a race’s predictability. 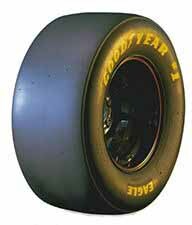 How can the fan, blogger, fantasy player, etc., figure out if Goodyear is indeed bringing a tire to a race that differs from the tire used in the previous race at that track? I get the impression it happens just about every race, but that’s based soley on what I hear from Darrell Waltrip, Larry McReynolds, etc., during the practice telecasts. Are there any reliable, consistent NASCAR tire information sources out there? This week I came across two tire-related articles I found pretty interesting. The first, “Goodyear Gets a Grip in Cup Series” by David Newton at ESPN.com, discusses the strides Goodyear has made since the tire debacle at the 2008 NASCAR Sprint Cup race in Indianapolis. The second, “Goodyear Finally Has a Grip… Or Do They?” by Bryan Davis Keith at Frontstretch.com, provides some counterpoint to Newton’s piece, and raises the alarm that perhaps Goodyear has not learned its lesson. I’d love your feedback, thoughts, etc., on the questions and/or the articles. This entry was posted in Tips, Tactics & Tools and tagged article recommendation, prediction theory on March 17, 2010 by Jed Henson.